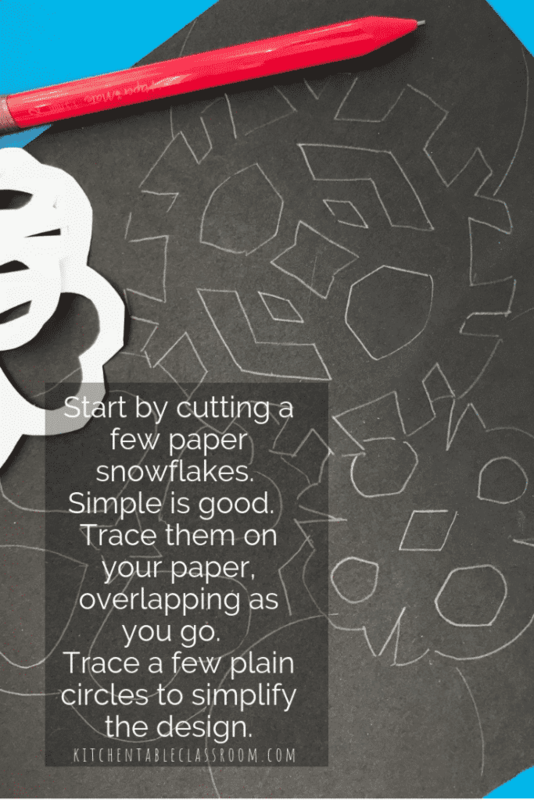 Is there any project that brings back childhood memories like cutting paper snowflakes? We’ve all done it. 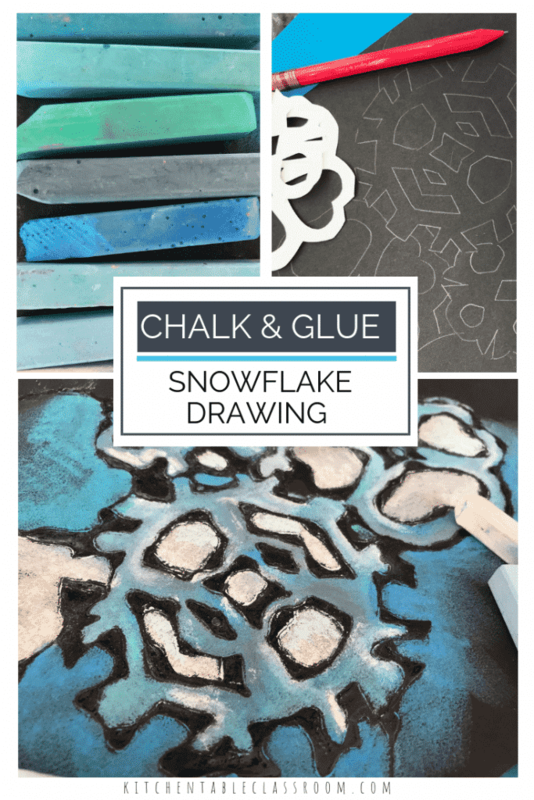 This project starts with simple cut snowflakes and turns them into an easy snowflake drawing finished with chalk & glue. 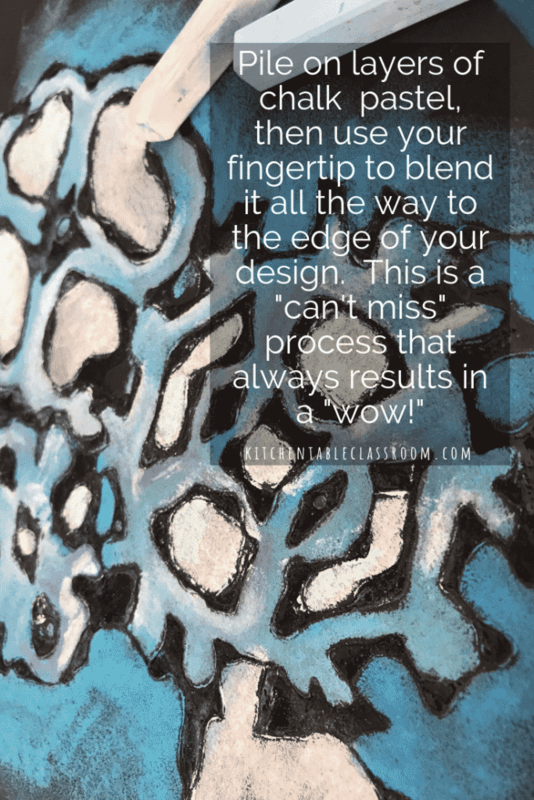 What’s with the chalk and glue…..
I’ve used this pair before to make abstract designs perfect for younger kids and even a portrait project. Check out those results here. 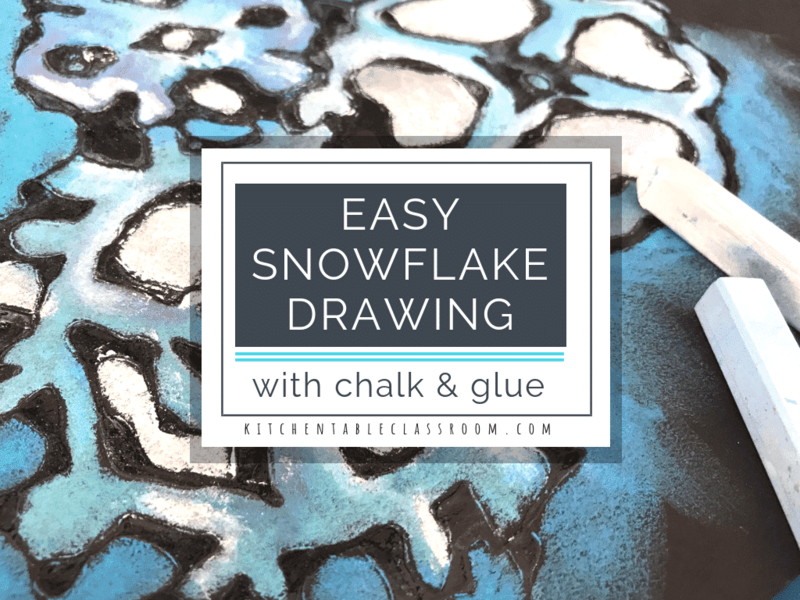 The secret to turning this easy snowflake drawing into a showstopper is the shiny glue outlines on black paper give kids a kind of “fence” to help contain their pastels. The glue is a framework, a skeleton of sorts, that provides some structure to a medium that can get a bit muddy for kids. Start with an easy snowflake drawing…. I used 9 x 12 black construction paper and then sized my snowflakes accordingly. I cut two different paper snowflakes in slightly different sizes. Trace a roll of masking tape, random bowl, or use a protractor to get two perfect circles. Fold the circles into quarters and cut some simple shapes out. This is not the time to get super fancy. Think simple. Trace your cut paper snowflake onto the black paper using a pencil. Depending on the abilities of your child and the sizes of their cut paper snowflakes they may only trace one or two of their snowflake drawings. This is fine. If the composition looks empty and needs broken up a bit trace some simple circles using a lid or a roll of tape. 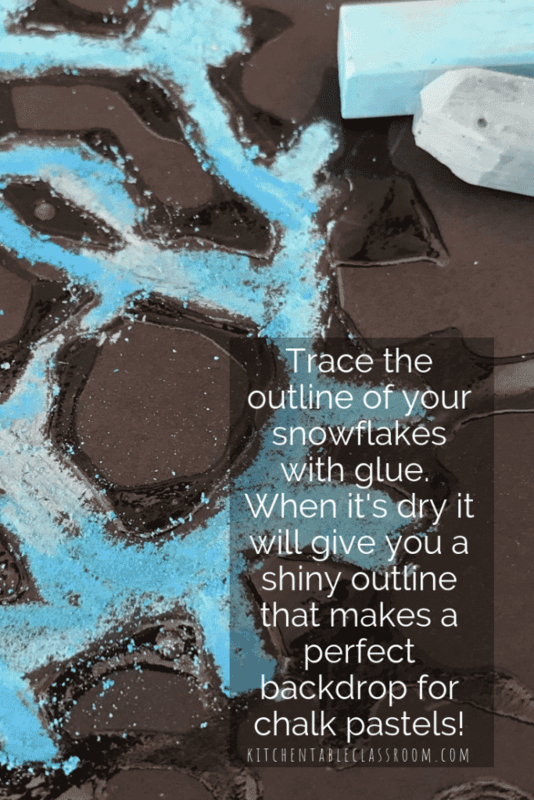 Add glue to your snowflake drawing …. Trace all the lines with glue. For years I have used regular Elmer’s school glue for this. It works. If this what you have, use it. However, I recently discovered that Elmer’s Washable Clear Glue leaves amazing bright, shiny glue lines when dry. I love it and will always use this in the future. Tracing lines with glue can be an exercise in control for kids. But here’s a little secret; if they don’t stay on the lines it’s okay. If the lines of glue run together, it’s okay. The combination of black lines and bright chalk is always a dynamic one, even if things go a little off track. Add color to your easy snowflake drawing…. Break out those chalk pastels. Mungyo pastels are my favorite for kids. This 64 set has tons of great colors and is inexpensive enough to let kids have free reign. This is a great time for a little color theory lesson. (Maybe even start with this free printable color theory book.) We used only cool colors for our snowflakes; blues, greens, grays, and purples. Time to blend your colors…. Use the tip of your pointer finger to blend colors all the way to the edge of the glue outline of your snowflake. The glue will “resist” the chalk so there’s no danger of covering it up. Colors that were next to each other will now blend together seamlessly, like magic. Choose a background color for your chalk snowflakes that will help them pop. Depending on the colors used that may be white or even a darker blue or gray. When you’re done the only black paper left showing should be the glue outlines. Chalk pastel can rub right off the page if you’re not careful. If your chalk snowflakes are going to be displayed in a public place or handled a lot you want to make sure to “fix” the pastel to the paper. If your easy snowflake drawing is going directly to the refrigerator without much handling it should be fine with or without spraying. If you enjoyed this easy snowflake drawing with chalk and glue please on your favorite social media channel. Every single share helps me to grow the Kitchen Table Classroom and bring you more fun projects and more free printables! Thank you for this wonderful chalk Project! One that both our 5 &7 year old grandboyos will love! Thanks for your kind words Betty! I would love to see what their creations look like! Thanks for the feedback Machelle! I love knowing how my readers use my materials! This looks great: a really fun afterschool art project we can do together. Thank you! Thanks Martina! I’d love to see how yours turn out!